High quality and offering an excellent touch… the Japanese textiles incorporated into the apparel of global sports and luxury brands around the world are now facing a crisis. With soaring fuel prices, insufficient labour, logistical challenges, a perfect storm of challenges has gathered, and many in the industry warn they may not be able to survive. While Japan’s textile regions have overcome countless trials in the past, such as the shift to overseas manufacturing, if the situation remains unchanged, their continued existence is doubtful. There is a need to share the search for solutions throughout the entire supply chain, including with apparel makers and retailers. Japanese textiles have firmly established themselves in the world. The Hokuriku region is known for chemical synthetic fibres, Bishu is known for wool, Wakayama for knits, and Sambi for denim. Each region possesses highly sophisticated processing technology and can handle everything from thread spinning, to weaving and dyeing to produce superb fabrics with an excellent touch and high added value. Japanese textile manufacturing is primarily done in a distributed fashion. It is primarily divided into thread spinning, weaving, knitting and dyeing, and there are many detailed preparatory and post processes. If any step in this complex process becomes stuck, it can quickly lead to delays in final delivery. Many multi-layered factors affect this fundamentally unstable arrangement, and lead to delays in final delivery. Among the many processes, however, fabric dyeing stands out particularly as an issue. China holds the overwhelming world share in the dyes used in fabric dyeing, including the intermediate ingredients. Chinese environmental regulations have become more stringent in recent years, however, putting the brakes on the dye manufacturing industry, leading to product shortages and waste. The costs of dyes have also skyrocketed, and remained high even after the supply has been restored. Labour shortages are also affecting the Japanese textile industry. Japan’s textile regions are made up of many small and medium-sized companies, and they tend to lag other industries in terms of working conditions. As all of Japan competes for workers amidst the continuing labour shortage, the textile industry finds itself at a disadvantage. While examples of progressive initiatives can be seen, such as Daiichi Orimono in Fukui Prefecture fully introducing weekly holidays, they have still only permeated a portion of the industry. There are cases where companies cannot even meet orders received due to a lack of labour. Indirect effects on the industry can also be seen, particularly in logistics. It is not only a matter of insufficient drivers and high delivery costs, effects are also being seen from a reduced number of shipments in and out of regions. Both during and outside of busy periods, there are more than a few cases where completed products cannot be shipped. Furthermore, when textiles are transported within Japan, they are often only provisionally wrapped, and make inefficient use of the truck delivery space. There are also many workshops that make it a custom to ask for the driver’s help when loading the products, which falls outside the driver’s typical professional duties, which has led to many shipping companies avoiding the textile industry altogether. In response to this situation, KOMATSU MATERE (formerly Komatsu Seiren) has decided to introduce pallet-based shipping from 2019 to both reduce the required labour and increase shipping efficiency. 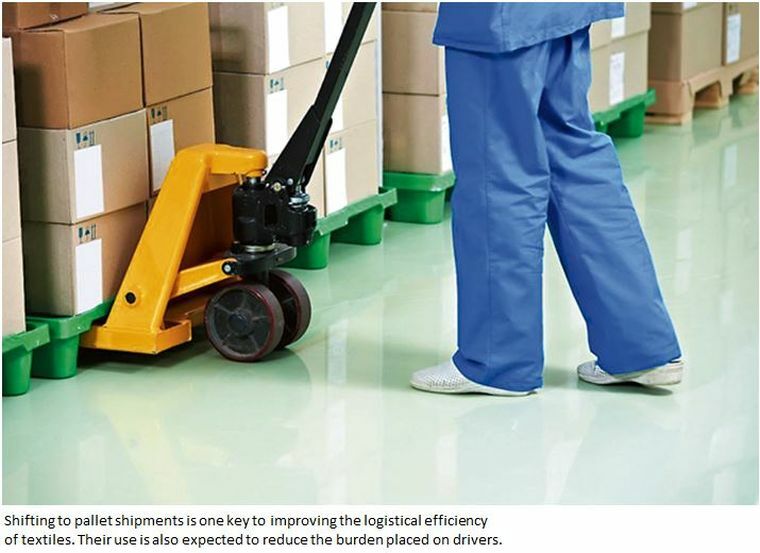 Many companies in the Hokuriku region are also being requested by logistics companies to consider the introduction of shipping pallets, but the movement postpones the challenges of the introduction cost and adjusting work processes to the new system. The Japanese textile industry also faces burdens that arise from its business practices. In the Hokuriku region, which specializes in chemical synthetic fibres, the cost of orders made by synthetic fibre manufacturers also includes logistics and a certain period of warehousing for the fabrics. The dyeing workshops, which process the fabrics last, must carry the burden of this cost, and must often struggle with matters outside their core business of fabric dyeing. There is no doubt this problem will be difficult to solve if it is considered one of the textile industry alone. While initiatives can be seen such as the J∞QUALITY certification of genuine Japanese quality, and apparel shops that make their use of made-in-Japan textiles a selling point, the domestic textile industry is still in danger if the situation remains unchanged. There is a need to distribute the cost burden appropriately throughout the entire supply chain and devise solutions to the challenges faced by the industry.